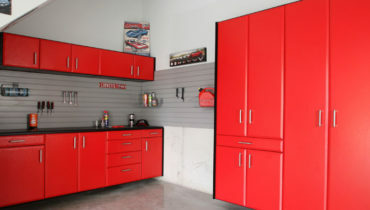 You can customize your garage cabinets with over 250 options to choose from so they work for you. With customizable options like color, finish, and countertops, your custom garage cabinets are perfectly tailored to your personal style. You’ll want to show off your sleek new garage to every guest who walks through your front door! Take advantage of every inch of your garage’s wallspace. With slatwall storage, you can hang and store hundreds of pounds of your belongings, everything from heavy tools to outdoor sports equipment and anything inbetween. We also provide hooks, brackets, and other wall accessories so you don’t have to shop around for all the extras. Your garage floor gets the most traffic of any room in your house. Upgrade to a durable, polyaspartic floor coating and get the added strength of a finished floor with an attractive array of color choices. 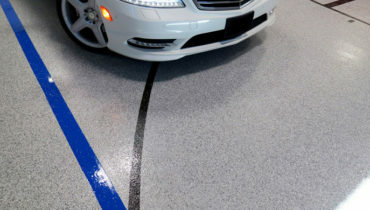 Not only is it the most durable floor coating solution, but you can drive on it within 24 hours of installation. Your garage is likely the most multi-purpose room in your home. It houses your cars, bikes, sports equipment, tools, childhood memories, keepsakes, and everything else you don’t have room for inside your home. And it’s so easy for all of that to get messy and disorganized. When your neighbor stops by to borrow a rake, they shouldn’t assume you have a hoarding problem when they step in your garage. Your ladder is awkwardly laying sideways with your bikes propped up against it. All the kids’ sports gear is mixed up in the same bin, basketballs with baseball bats with golf clubs. It’s hard to find a wrench when you need one with all your tools scattered around the garage. Your fishing rods and camping gear are tangled up and tossed together. It’s stressful just thinking about grabbing something out of there! Sure you’ve wanted to fix the chaos for a long time, but where do you even start? How do you organize your garage without cramming everything in bulky cardboard boxes? GOT CLUTTER? WE KNOW THIS PROBLEM ALL TOO WELL – SO WE SOLVED IT. Imagine upgrading your garage with the same level of high end finishes you’d see inside your home, customized with your exact sense of style. High quality finishes, sophisticated colors of your choice, and the most intelligent use of space. Every part of your garage, utilized to perfection. Rather than a clutter of your belongings, organize your tools in our customized cabinets, separate your sports equipment with our slatwall storage, and open up your space. Carolina Garage Company provides storage and flooring solutions for homeowners who embrace and demand seamless beauty, effortless longevity, and unlimited possibilities for an organized garage space. 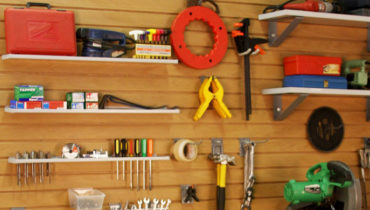 Our high end garage cabinets allow you to organize your hand tools, yard tools, sports equipment, and more. Our custom garage storage solutions transform your garage into an extension of not just your home, but also your personality and lifestyle. With over 250 cabinet design options and 11 premium stylized powder coat finishes, your garage is sure to be the envy of the neighborhood! Locate your nearest authorized dealer here or contact Carolina Garage Company for a project consultation today.